Don't let your awesome footage go to waste! 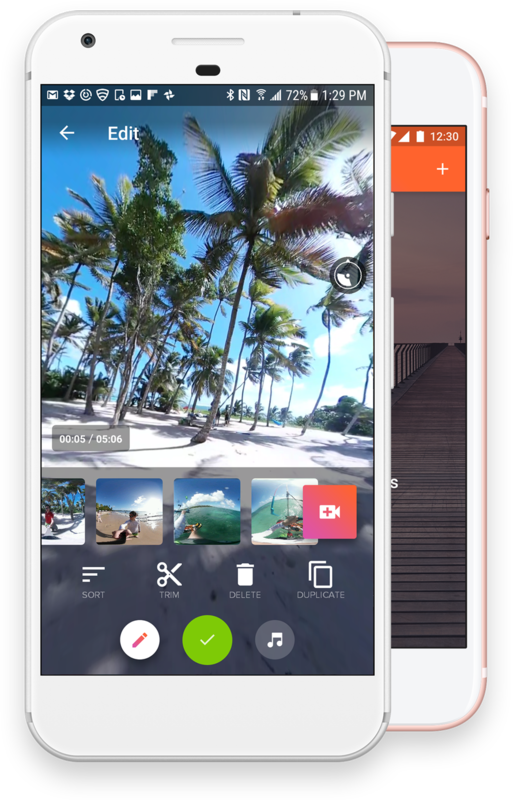 V360 is an app that lets you create amazing 360 video shorts from your mobile phone. Trim, sort, add music, and share your 360 video clips in beautiful 4K resolution. If you have a Samsung Gear360, a Ricoh Theta 360 camera, a Nikon Keymission, or a 360 Fly, this app is a must-have! The app is truly a gem. I am a video editor, I needed the ability to edit 360 videos on the fly. Finally someone wants to create a 360 video editing tool on smartphone. Fantastic app just been using it with my gear 360. Fast with great results so far. Get your footage featured on our YT channel and FB page by uploading it with the hashtag #madewithv360! Own a technology business? Offer your customers a quick and simple way to edit, customize, and share their footage. We offer both whitelabel apps and bundled software solutions (with pro license). Don’t let your users' footage go to waste! © Copyright 2017 Avincel Group, Inc. All Rights Reserved.